Want to invest in the entire Harry Potter movie collection for cheap? 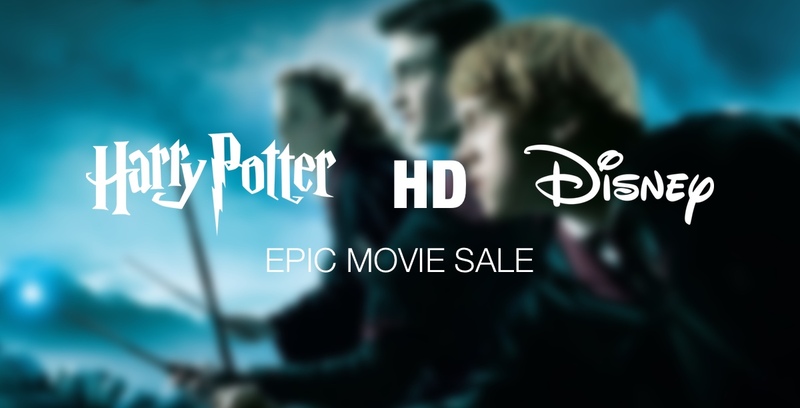 Or looking to grab a Disney movie for just $3.99 or an HD movie for $0.99? We have the hottest deals here. If you happen to be a movie buff who loves nothing more than consuming some of the best blockbusters in the comfort of your own home, then you definitely need to sit up and take interest in this collection of mega movie deals. It’s definitely fair to suggest that movies invoke an emotive reaction in a large percentage of the population. Creators put together movies that make us think, make us question our reality, and even drive us to emotional outbursts of tears. Granted, some of the greats are designed to be watched on glorious huge screens in the cinema but in the absence of that, the next best scenario is owning the movie yourself and watching it in the comfort of your own home in high-definition or UHD. And that, our friends, is exactly where the below deals come into play. This is an absolute dream for any Harry Potter and JK Rowling fans. This wonderful and highly collectible deal includes 8 4K UHD Blu-ray discs and 8 standard Blu-Ray discs for those who have a high-definition set but haven’t yet taken the leap toward 4K. That’s 16 discs in total and coverage for every single one of the Harry Potter movies which are destined to go down in the sands of time as some of the most successful and iconic flicks ever made. And, what’s more, you will even get access to the digital copies of the collection. The title of this deal really speaks for itself. It’s an opportunity to own an array of different Disney titles spanning across multiple genres and multiple release years without having to actually pay anywhere near full price for the honor. You can grab movies like Honey, I Shrunk The Kids, Mighty Joe Young, and even Herbie: Fully Loaded if you are into the remarkable work of Lindsay Lohan. If animation is your thing, then fall back to Enchanted, The Aristocrats, or even the iconic The Sword in the Stone. There is literally something for all of the family in here. And remember, there is no shame in admitting that you love Disney and are willing to spend a lot of money on Disney DVDs. Last but not the least, you can grab yourself a few HD movies and documentaries straight from Amazon for a throwaway price of just $0.99 apiece. You might not find anything groundbreaking here, but hey, you never know that the movie you always wanted in your life could be hiding in there somewhere. Also, it’s a great opportunity to expand on your digital library right away.